Getting a dental bridge is one of the best ways to maintain your natural bite and prevent shifting of surrounding teeth. Dr. Foad Farhoumand, Dr. Farah Farhoumand, and the team at Farhoumand Dentistry in Vienna, Virginia, can design a beautiful, natural-looking dental bridge that’s customized for you. If you’re gearing up for an extraction, or you already had one or more teeth pulled, schedule a consultation to see if a bridge is right for you. Book your visit through the online scheduling system or call the office today. Getting a dental bridge can also help give you a boost in confidence if you’ve been hiding your smile because of a large gap. In some cases, a bridge might be the best option if you’re not an ideal candidate for a dental implant because of bone and tissue loss. What is it like to get a dental bridge? First, your dentist will evaluate you to make sure a dental bridge is right for you. Next, your dentist will carefully sculpt your surrounding teeth and shapes them to serve as anchors for your bridge. You will be given a numbing agent during this process, so you shouldn’t feel any pain or discomfort. Generally, men and women have their teeth shaped on either side of the gap. But if you’re missing a tooth at the end, the last tooth you have will be shaped to serve as the anchor. After your teeth are ready, the team will gather impressions or 3D images of your bite to send to the lab. Once your dental bridge comes in, the team will call you to schedule an appointment to have it bonded. Because Dr. Foad and Dr. Farah work closely with the best labs in the United States, you can feel confident that your bridge will look natural and blend in seamlessly with the rest of your smile. 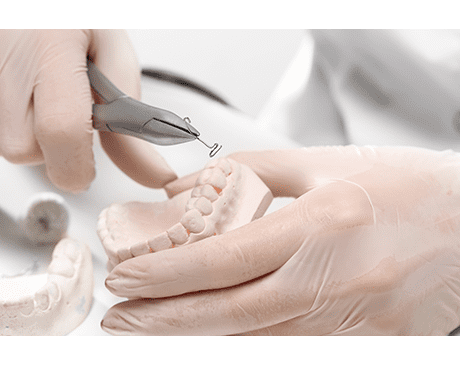 Modern dental bridges are made of rugged, durable materials like porcelain and ceramic. These artificial materials closely mimic your natural teeth, so your bridge can maintain years of wear and tear. With good oral hygiene and regular checkups at Farhoumand Dentistry, you can expect your dental bridge to last at least 10 years. Whether you need a replacement dental bridge or you have a gap that might require one, schedule an evaluation at Farhoumand Dentistry. Book your visit online or over the phone today.